Have you ever left a tender houseplant on the porch or patio during a cold snap? What about that time there was an early frost and you forgot to cover the tomatoes? If you remember how frustrated you felt at finding your plants killed or damaged by the chill, can you imagine what it would be like for a citrus grower to see this? After effects of a killing freeze. 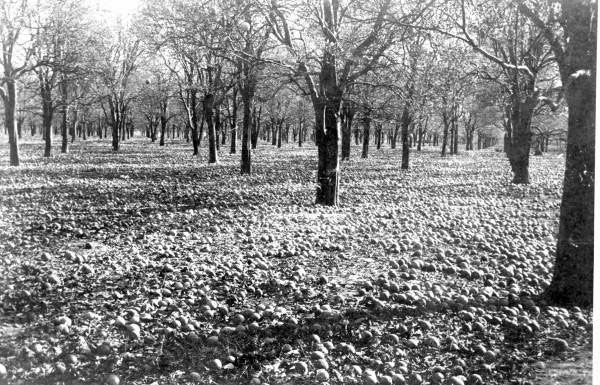 Yes, that’s thousands of ruined oranges on the ground after a killing freeze (a long time ago, fortunately). In the past, citrus growers often lost their whole livelihood in a single episode of below-freezing weather. It’s happened many times in Florida’s history. Various ways citrus trees were protected from cold weather. Later, in-grove heaters, which kept the air warm around the trees, and wind machines, which “mixed” ground-level cold air with cooler air higher up, became very popular. But today, Florida growers overwhelmingly use a method called micro-irrigation to protect their groves. You might have seen a photo of oranges after micro-irrigation. It’s eerily beautiful, but it doesn’t really look like it would be good for the tree, does it? If this sounds kind of complicated, it is. Growers use some pretty high-tech equipment to monitor conditions and make sure the trees don’t accidentally get damaged, while also conserving water as much as possible. Growers often don’t get much sleep on cold nights. But at least we don’t have to build a little shed around each tree anymore! If you happen to have your own citrus trees at home, you may now be wondering if you should be covering them with ice when the mercury drops. The answer is no. This method is too fiddly and too risky for the home grower. 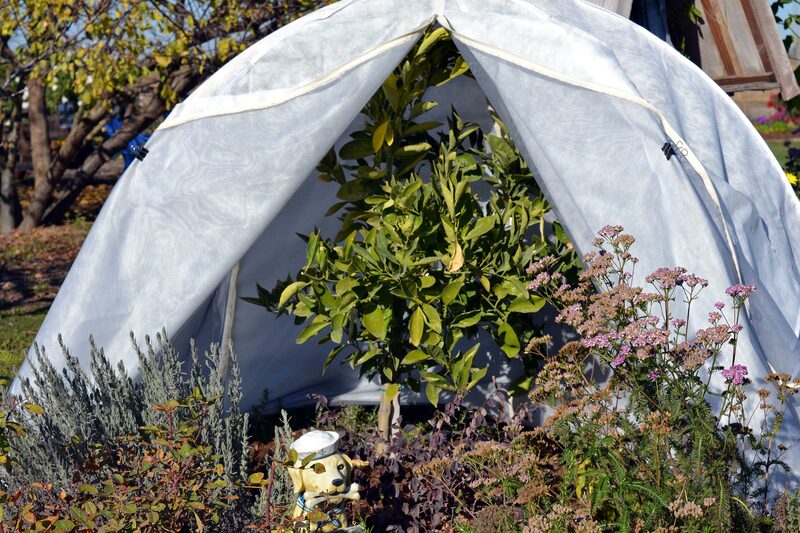 A tiny tent protecting a small orange tree from the cold. So what should you do? It depends in part on what type of trees you have, since some types of citrus are much more tender than others. In general, though, you probably don’t need to be concerned about your trees or their fruit till temperatures drop to 28 degrees or lower for four hours or more. If this is in your forecast, there are a few things you can try. First, water your trees well. It will help keep them warm, and reduce their stress. If your tree is small enough, drape it with a fabric cover; if it’s too big for this, wrap its trunk with cloth. You can also try putting strings of Christmas lights or another electric light on the trees to generate a bit of heat. And if the forecast looks really dire and your fruit is ripe, do pick it. Yes, it’s true; growing citrus in Florida, especially its more northern areas, can get a little complicated sometimes. But we’re sure you’ll agree that the sweet, juicy fruit we harvest makes it all worthwhile. "Frozen Florida Orange Juice?" by Little_Karen. "Tented Orange Tree" from Gardens for Goldens licensed under CC BY-NC-SA 3.0. It seems these days that all people are talking about protecting the environment, using green https://www.babykidshq.com/ we should save our planet earth for the next generations ( our babies), it seems that this is the trend for this age, It's a Go-Green Era! Here I won't disagree with that, on the contrary I will give you the top 10 reasons why we should stick to using these eco- friendly, organic products for babies, and I will explain - in brief - what is the difference between the green, the organic and the organic baby products.